Yes, it’s true. Unlikely, but the math adds up. So how can a guy whose PB is 11.54 sec (or 11.3 hand time) for the 100 meters run a world record in the 400m of 43.18? In theory, it’s possible. 11.54 is about 10.54 (fly time) if you take in account 1 sec for acceleration out of the blocks. (Read my Valery Borzov article) This translates to an average speed of 9.48m/s, or about 42.18 sec for 400m. Add 1 sec for acceleration, and voila, you have 43.18! But that is pure fantasy. Everyone slows down after reaching maximum velocity, approximately 7 seconds or 60 meters in men for a 100m, 200m, and 400m. The rest is speed endurance. 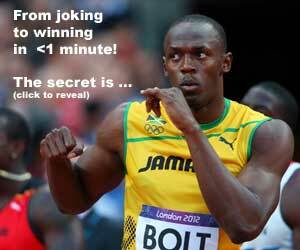 In fact, the 400m is one long deceleration after reaching top speed at 60m. Tellez 5 phases of the 100m sprint outlines how 12% of the race is “Lessened Degree of Deceleration”. John Smith of HSI always said his goal was to eliminate that deceleration phase.. which would mean extending the acceleration and maxV from 60m to 100. We are already seeing Usain Bolt and Tyson Gay reaching maxV at 70m. When can we see this in a 100m? Or 400m? You’ve heard the expression: In a 100m race, the person who slows down the least wins the race. It may appear the sprinter is speeding up, but in reality, the others are slowing down. Just watch Carl Lewis in the 1984 100m Olympic final. It looks like he is speeding up in the last 10m, but in fact, everyone is slowing down. Most seasoned 200m sprinters slow down about 0.5 sec between the first and second 100m when you take in account 1 sec for acceleration out of the blocks. By the way, you can’t take a 100m time and double it to determine the worlds fastest man compared to a 200m sprinter, because the 2nd 100m has a running start. Memories if the 1997 Skydome match race between Donovan Bailey/Michael Johnson come to mind. 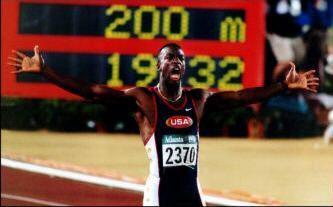 Speaking of Michael, the greatest example of someone running the perfect race with minimal slowdown is his 200m WR of 19.32 seconds in the 1996 Atlanta Olympics. 19.32 = (1 + 9.12) + 9.20 = a slowdown of 0.08 between his first and second 100m. Absolutely phenomenon! That race still gives me the chills when I see it. Yes, a 42 point… one can only dream.